When General MacArthur returned to the US he received a hero's welcome, and told Congress, "Old soldiers never die; they only fade away." He had been sent to Korea to stop North Koreans under Kim Il-Sung taking over the South. He succeeded in driving back the enemy beyond the 38th parallel but UN and US troops were pushed back south when Chinese Communist forces joined the war. General Ridgway agreed to ceasefire talks in July 1951 but they broke down. In 1952, some Republicans tried but failed to nominate General MacArthur for the US presidency after which he retired from public life. 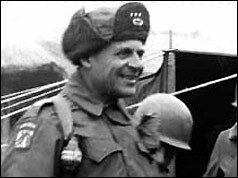 It was General Dwight D Eisenhower who was elected US President that year and General Ridgway took over his job as supreme commander of the Allied forces in Europe (Nato). But a peace deal has never been reached. American troops remain stationed in the de-militarized zone on and around the 38th parallel separating North and South Korea.